Fig. 1 Time evolution of global temperature, CO2 concentration and solar activity. Temperature and CO2 are scaled relative to each other according to the physically expected CO2 effect on climate (i.e. the best estimate of transient climate sensitivity). The amplitude of the solar curve is scaled to correspond to the observed correlation of solar and temperature data. (Details are explained here.) You can generate and adapt this graph to your taste here, where you can also copy a code with which the graph can be embedded as a widget on your own website (as on my home page). Thus it will be automatically updated each year with the latest data. Thanks to our reader Bernd Herd who programmed this. Fig. 2 Time series of the Sun’s luminosity from the World Radiation Center in Davos. As climate scientists we are by no means surprised at this development, as there has been clear evidence that the variations of the sun’s activity have played a completely subordinate role in climate change over the last 65 years. We’ve covered this issue many times, e.g. here, here and here. Global warming is driven by greenhouse gases, which is a long-standing consensus in science. The current IPCC report, for example, limits the natural contribution to global warming since 1950 to less than plus or minus 0.1 ° C (it might have been negative e.g. because of the fading sun). However, some unsupported claims by “climate skeptics” about the importance of solar variability are now clearly falsified. Climate skeptics have repeatedly predicted an imminent global cooling because of the weak sun. Attributing global warming to the sun has become untenable, because solar activity has not increased for the last 65 years. It has been essentially constant, except for the well-known 11-year Schwabe cycle (which also has little effect on global temperature) and a slight downward trend . The excuse of the skeptics here is usually that global warming is a time-delayed reaction to an increase in solar activity before 1950. The basic idea is not entirely wrong: the climate system has a certain inertia. If the solar luminosity were to be increased in a sudden step, the temperature would not rise immediately, as it would take a while to heat up the oceans. This inertia effect can be quantified with the help of model simulations. Caldeira and Myhrvold (ERL 2013) have shown that 60% of the temperature reaction occurs within the first 20 years. However, around 80% of global warming since the 19th century has only taken place after 1970. It is therefore unthinkable that the slight and gradual increase in solar activity before 1950 could have contributed significantly to the strong warming since the 1970s. Further evidence for this is the comparison of temperatures of land and sea. Everyone knows: when the sun rises in the morning, it takes only a few hours (certainly not decades) to heat the air strongly. Over 90% of the thermal inertia resides in the ocean, while the air over land quickly heats up. If the global warming since 1970 were a delayed response to a previous increase in solar luminosity, then we would now observe above all a catch-up warming of the oceans. The opposite is the case: the continents heat up more quickly and the ocean temperatures are lagging behind. Another point: even if solar variability, for some magical reason, had a noticeable warming effect over the last decades, this would have to come in addition to the CO2-effect and would not call it into question. The warming effect of CO2 on climate is physically well-understood, and the sensitivity of global temperature to CO2 is independently confirmed by paleoclimatic data, see e.g. Rohling et al. 2012 or the brand-new paper by Friedrich et al. 2016 (here is a nice write-up on this paper from Peter Hannam in the Sydney Morning Herald). The winters are becoming noticeably harsher. That worries all those who are concerned about why global warming is obviously pausing. Of course, it’s the sun, stupid! In his 2012 book, Die kalte Sonne (co-written with Sebastian Lüning also from RWE; literally the title translates as The Cold Sun) he then presented his own forecast for the global temperature evolution until 2030. In Figure 3 we compare this to measured data. No comment required. Vahrenholt and Lüning’s book does have one clear merit, however, and that is its title. The Cold Sun nicely sums up the fact that the sun is currently weak – good to know at a time of unprecedented global warming! Thanks. I’ve been making that point for some time now in conversation with ‘cold sun’ enthusiasts that they are now in ‘own goal’ territory when crowing about how low the current solar cycle is. Nice, firstly, to have the validation that I’m on the right track there, and second, to have some good supporting information–plus the updated models/obs graph! That Verenholt prediction looks oddly like a girma-based, AMO stadium wave, with a dash of curry tossed in, so stay tuned… the Trump administration is going to order one of those to be whipped up. All your points about the Sun are well made. However, the CO2 line on the first graph does not show the recent pause in the growth of CO2 concentration. Should it ? I think the post here could have emphasised more how relatively small the solar variations are that it speaks of. A slightly longer reply may be useful. The talk of CO2 emissions plateauing over the last few years concerns only the emissions resulting from fossil-fuel use. The emissions from land-use change have also to be considered and they may not be so plateau-like. But even if they were, that ‘first graph’ shows not emissions but atmospheric concentrations. Concentrations are currently rising at a little over 2ppm per year (if we ignore the boost from the recent El Nino), that rise having been accelerating since direct measurments began in 1958 at something like 2% per year due to a similar annual rise in the size of our emissions. If emissions did plateau, the atmospheric concentrations would continue to rise at a steady rate but with just 2% (compound) difference from the rises of recent decades. With all the variation cluttering up the individual annual increases, it would take a decade or more to spot statistically that there was a plateau in the atmospheric data, and it would take many decades for it to become noticeable in the charts like that ‘first graph’. [Response: That is a good point and I often show graphs using the first 30 years of the record (1880-1910) as the baseline. But note that this is not “preindustrial”; “The Industrial Revolution was the transition to new manufacturing processes in the period from about 1760 to sometime between 1820 and 1840.” (Quote from Wikipedia). We don’t have an accurate measure of global mean preindustrial temperature, which makes it impractical as a baseline for graphs. Thank you, “The Guardian”. I am now informed that the global warming in 2016 will most likely be 1,2 degC with respect to the pre-industrial time. This I can consider with respect to the goal of 1,5 degC. You did what a journalist should do, dug out the number from some most obscure and messy pronouncements of the World Meteorological Organization. Another popular number seems to be about 0,8 degC, with reference to some recent 30-year period. This is of course based on a standard way of measurement established in the 1930’s. As I understand, the climate measurement standard was agreed upon based on user needs in some IMO (now WMO) conference, in response to user needs. The users of climate data at the time were farmers trying to understand if grapes, corn, wheat or barley was the proper planting choice for a given field, as well as city folks dimensioning their storm drains, etc. 30 years was found to be a statistically justifiable shortest period of time. Thence a stepwise running base of 30 years was adopted. It was stepwise because a yearly re-computing was not practical with the available technology in the 1930’s. Now the users and their needs have changed. In response, a new standard has been adopted by these users. It reads “with respect to the pre-industrial time”. Unfortunately, the climate scientists have not yet identified this change in user needs. Thanks for this clarity and detail, Stefan. Also to Pekka, for positing a more credible preindustrial benchmark, showing us at 1.2C warming. That should become standard, and reduce confusion among laymen such as myself. I know that RC likes to avoid politics, but in this case the hour is getting late, and the added threats by Trump and friends existential. Your thoughts from Europe re Sarkozy etc. would be welcomed. Stefan, you mentioned Friedrich et al. (2016) for a confirming of climate sensivity from paleo-data. Did you read this: http://julesandjames.blogspot.de/2016/11/apocalpyse-now.html where James has some critiques e.g. :”It’s difficult because I know and like several of the authors, and they are certainly talented scientists, but I doubt they will look back at this as one of their finest moments.”? Do you belive the very high sensivity from this study while James Annan says: “So, in summary, nice try, but I don’t believe it, and I don’t really think the authors do either.”? Recall all the press “noted climate skeptics” Willie Soon and Sallie Baliunas got on this very issue 20 years ago? Not that it was any more valid an argument then than it is now, but it just shows how tiresome the climate denialist crowd can be. I think the progress towards renewable energy is going to driven by countries like China and Germany that have few fossil fuel reserves. Trump may be a climate denialist, but he can’t “bring back coal” for basic economic reasons; everyone is abandoning coal-fired electricity for reasons of cost, pollution, and climate all over the world. Also, I found the previous administration’s policies on fossil fuels very unhelpful; promoting fracking and offshore drilling and U.S. oil exports were all signature efforts of the Obama Administration – while passing no renewable energy law.
. . . The key piece of legislation in recent years for advancing renewable electricity in China is the Renewable Energy Law of 2005. The law was designed to “promote the development and utilization of renewable energy, improve the energy structure, diversify energy supplies, safeguard energy security, protect the environment, and realize the sustainable development of the economy and society. . . So if we’re lucky, global economic favorables for renewable energy adoption will overcome efforts by the new administration to subsidize coal and other fossil fuels while trying to block renewable energy. 5. So, [3(b)] is continuously increasing with growth in urbanization [this was noted more than 250 years back in London]; (1 & 2) reached its peaks in 2016. By eliminating these positive trends only can give the real picture of 2016 relative to earlier data. 6. My studies in 70s & 80s using rainfall data series over different parts of the globe matches the drought conditions over different parts — which was attributed to global warming by WMO and sent my response to Secretary General of WMO as those of my publications are with WMO library [book was reviewed by the Vice-President of Agrometeorology group in WMO]. Reddy, S. J. (2016): Climate change and its impacts: Ground realities, BSPublication, Hyderabad, Telangana, India. Somebody needs to show that graph to Donald Trump, the one on temperature versus solar activity at the top of the page. I mean seriously it portrays such an important thing, and is easy to grasp for non scientists. Trump understandably wont have time for masses of detail on climate science, but he might get the message in this simple graph. I since the sun, i.e now the dubbed cold sun has been found to be at a colder state fr close to a century it would flawed to think that the cold winters are only beginning to show, so the cold sun does not fully explain the harsher winters. ON another note I would like to state that CO2 is not a toxic gas, it is vital for the carbon based life cycle on Earth. there are more toxix gases being released into the atmosphere than CO2, namely the greatly ignored methane is much more harmful, think Of biogass produced through wast biomass indeed but musch more toxic. Certainly we should be plating more tree to offset the CO2 with reduction goals as well. In a given environment heat CO2 levels and sunlight intensity depends on the rate of photosynthesis of plants. Given that there is more CO2 now and arguably the temperature allegedly risen there should be more photosynthesis. Even more so agricultural output yeild should be larger. N 14: agricultural output yeild [sic] should be larger. BPL: That would be true only if higher CO2 were the only thing that changed. The nutrient available in least supply (Liebig’s Law of the Minimum) is much more likely to be water, and since global warming increases drought, agricultural output will suffer. Dr. S. Jeevananda Reddy @11. (1) Aren’t you misrepresenting the status of your published work? A search of BS Publications shows no such published work as “Reddy, S. J. (2016): Climate change and its impacts: Ground realities, BSPublication, Hyderabad, Telangana, India.” Is your work still “under Printng” as you said it was when you wrote to the Prime Minister of India back in April? If so, BS Publications must have a serious backlog of work. I suggest finding an alternative printer. This is pretty-much the sum of your points (1) to (5) @11 but seem to be based on simple curve-fitting & unsupported assertion. (Or more correctly, you do not provide any evidence for such controversial positions and thus the implication is as I said.) Is my assessment correct or do you have some proper reason for these unsupported assertions you so boldly present to us here? An irrelevant red herring. No one argues that CO2 is toxic at current or projected levels. I suggest you look up Liebig’s Law of the Minimum, and also read up on the results of the FACE open air enhanced CO2 trials: higher CO2 promotes faster and more robust plant growth in only some species, but even then it mainly promotes increased production of cellulose and lignin in the plant stem and leaf structure rather than in increased fruit and seed yield. At the same time, other research shows that increased heat will be detrimental to many domesticated cereal crops, plus it will promote increased loss of soil moisture, both of which will promote reduced crop yields. In other words, your assertion has been shown to be false. MA Roger at 15 and Hank Roberts — the book titled “Climate Change and its Impacts: Ground Realities” was published [I circulated already to several institutions including Prime Minister of India [whose office acknowledged the receipt of the same dated 31st October 2016]. In fact carried these books to USA when I visited in 22nd September 2016. You please look in to WMO (1966) mannual on “climate change” for the types analysis used to separate trend from cyclic variations which I did since early 1970s. Nah, the sun is hotter nowadays which is easily recognized when standing in the sun and comparing it to the slim days of youth. Thus the graph is a chinese hoax. We’ll start making america great again by manufacturing proper conservative thermometers that where the scale ends to 100F since anything above is sick. Dec 8, 2013 – s A trick question, of course. The answer is “the author of a blog post at WUWT entitled IPCC’s Report on Climate Change: Myths & Realities“. Jim Eager: An irrelevant red herring. No one argues that CO2 is toxic at current or projected levels. I watched a talk by Romm recently that in parts points out that CO2 is in fact mildly toxic — it affects decision-making, learning, and so on at levels above about 1000 ppm. While global concentrations are far below that, in local areas of high carbon pollution or poor air circulation (e.g. indoors, or on a highway), it’s not hard to reach already. As we increase the ambient concentration it will start to require increasing effort to keep levels below that 1000 ppm in various settings. Dr. SJ Reddy is wasting your time. He does not appear to have a grasp of basic climate dynamics, and I say this as an only moderately informed layperson. Stoat (referenced @22 by a carefully reliable Hank Roberts) checked on him, as people new with new unskeptical “skeptic” assertions, but while he may have some understanding of Indian agriculture, his views on climate science are risible. If PM Modi is reading the copy sent to his office, he’s getting biased nonsense. There are some responses to his peculiar assertions here: http://dotearth.blogs.nytimes.com/2016/11/09/prospects-for-the-environment-and-environmentalism-under-president-trump/#permid=20442507 – several people have taken pains with it. He recurs, always insisting people read his book. Unfortunately, Trump’s ascendance appears to be inspiring more pushy climate denial hither and yon. Another toxic effect. I think your assessment that SJ Reddy is a waste of time appears to be correct. His precious book has no real web-presence except for Reddy’s comments. Responding to this, all he has managed to show is that the publisher exists, a fact already established. And his citing of the “WMO mannual on “climate change” for the types analysis used to separate trend from cyclic variations which I did since early 1970s” is not what he was citing it for in his December 2013 posting on Wattsupia. In Dec 2013 he was not using it as an authority on analytical method but instead criticising its analytical method. That is a rather unforgivable mistake, not the least because it shows Reddy to be an unreliable idiot. What is this “pause” of which you speak? Can you transform the data in the first graph so the time series are stationary? Probably need say a 10yr moving average on the temperature data. 27 Sebastian Luening – it is my hope that Stefan doesn’t say a single word to you in response to your post here. I think I am far better equipped to point out the obvious in a manner befitting the context as presented by your good self. Sebastian Lüning (alternatively spelled Sebastian Luening) is a geologist currently working for Portuguese oil and gas energy corporation, Galp Energia, according to his LinkedIn profile. He formerly worked for the oil and gas company RWE Dea AG in Hamburg, Germany. The drop in solar activity during the early 21st century may therefore be only fully implemented in global temperatures in the coming years to decades, if solar activity plays a more important role than currently assumed by the IPCC. MAY & IF … where’s your science and data to support your ifs and maybes in Fig 1? Sebastian, YES it does make sense. Your book is not a Peer-Reviewed Scientific Paper for a start. I suggest you submit one and get it published first! Should your “prognosis” be valid it will align with the real world in the present and the past immediately – does it? Sebastian, you no doubt have heard of the term CHERRY PICKING, right? 10/10 for Cherry picking Jan 2000 and Jan 1910. Congratulations. Readers on WUWT will love you for it and lay laurels at your feet. I will not! I don’t give a flying phuck what the outlier liars “in part” of the climate research community “consider” – Why? because they have been proven beyond all doubt on multiple occasions (by name) to be full of scheisse! Now as to the GISS adjustments and other homogenization done for land based temp data collections – the raw data is available via GISS and other sources. GO WRITE A PAPER ON IT – GET IT THROUGH PEER REVIEW – AND GET IT PUBLOISHED. Until then Sebastian you are talking scheisse! You appear to be better qualified as a politician or a marketer or a Pulp Fiction writer, and not as a scientist. 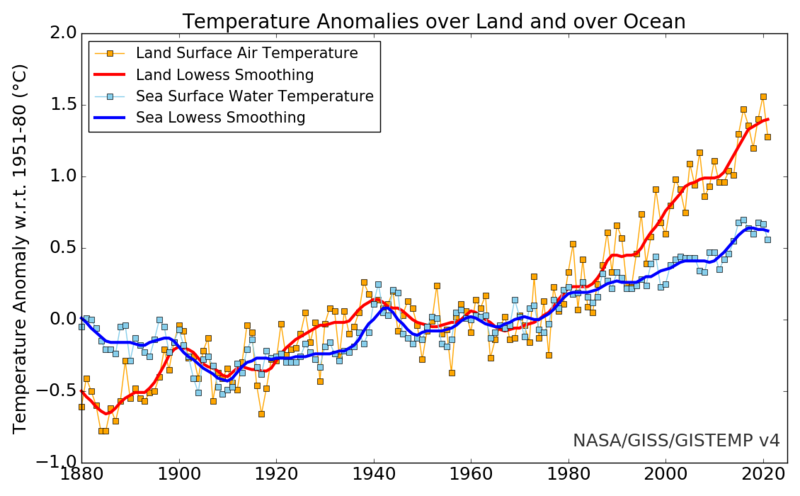 In case you missed it let me repeat it again – the global RSS satellite temperature data at 50,000 feet IS NOT GLOBAL LAND SURFACE TEMPERATURE – comprende vous mien fuhrer? But despite that which part of Fig. 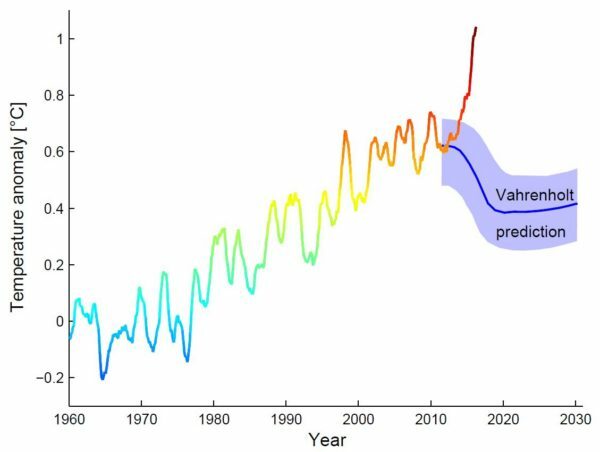 3: Measurements of global temperature (RSS, monthly values, last data point October 2016) compared to the forecast for global temperature til 2030 by Vahrenholt & Lüning (2012: Figure 73). Thick line represents 37 months moving average — ARE YOU UNABLE TO SEE? Fig. 5. 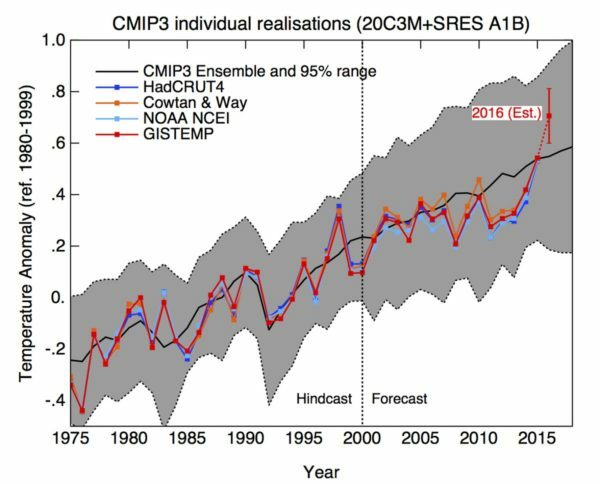 Measurements of global temperature (GISS, yearly average values) compared to the forecast for global temperature by Hansen et al. (1988). Oh here’s that Cherry picker again at play — Hansen has published a 100+ papers since 1988 — STOP LIVING IN THE PAST SEBASTIAN TO MAKE LOW LIFE POLITICAL POINTS THAT SERVE YOUR FINANCIAL & EGO BIASES. Fig. 6. Measurements of global temperature (RSS, black curve) compared to the extreme lower (green curve) and upper (red curve) forecasts for global temperature by the IPCC First Assessment Report (1990). See above re cherry picking etc. Go find the 5th Assessment report .. and then TRAWL the Literature for all the PEER-REVIEWED Papers published since then ….. OR STFU with this manipulative crap you’re selling the half wits on WUWT. Which undoubtedly proves one of two things Sebastian – you are either a complete IDIOT or you’re a LYING SHILL. It may even be both! But no way do you qualify as a honest qualified professional climate scientist. I’m sure this happened 100 years ago. The sun was very quiet around 1910 or so and then there was a spike in global temps in 1914-1915.